Well, when else will certainly you locate this possibility to obtain this publication Cress, By Marissa Meyer soft data? This is your excellent possibility to be below and get this wonderful publication Cress, By Marissa Meyer Never leave this publication prior to downloading this soft documents of Cress, By Marissa Meyer in link that we give. Cress, By Marissa Meyer will truly make a good deal to be your best friend in your lonely. It will certainly be the most effective companion to boost your company and hobby. When you are rushed of task target date as well as have no suggestion to get inspiration, Cress, By Marissa Meyer publication is among your solutions to take. Schedule Cress, By Marissa Meyer will certainly provide you the best resource and point to get motivations. It is not just about the tasks for politic company, administration, economics, as well as other. Some got jobs to make some fiction works also require inspirations to get rid of the job. As exactly what you require, this Cress, By Marissa Meyer will most likely be your selection. Obtaining the publications Cress, By Marissa Meyer now is not type of hard means. You could not only choosing publication shop or library or loaning from your good friends to review them. This is a very straightforward way to specifically get guide by on-line. This on-line e-book Cress, By Marissa Meyer could be one of the choices to accompany you when having extra time. It will certainly not lose your time. Think me, guide will reveal you brand-new thing to review. Simply spend little time to open this online book Cress, By Marissa Meyer as well as read them anywhere you are now. Sooner you obtain guide Cress, By Marissa Meyer, earlier you could take pleasure in checking out guide. It will certainly be your resort to maintain downloading the book Cress, By Marissa Meyer in offered web link. By doing this, you could actually choose that is offered to obtain your very own book on-line. Here, be the initial to obtain the publication entitled Cress, By Marissa Meyer and also be the first to know just how the writer suggests the message and expertise for you. Cinder and Captain Thorne are fugitives on the run, with Scarlet and Wolf in tow. Together they're plotting to overthrow Queen Levana and her army. Their best hope lies with Cress, who has been trapped on a satellite since childhood with only her netscreens as company. All that screen time has made Cress an excellent hacker; unfortunately, she's just received orders from Levana to track down Cinder and her handsome accomplice. 25 of 25 people found the following review helpful. A spectacular third book in the Lunar Chronicles that will have your head spinning in pure bliss! Filled with all the same fun characters from all the previous books, and some new and intriguing ones that bring a different kinda dynamic to the story, with a thickened plot and a world of trouble and drama, CRESS has lived up to all my expectations and some! What a mind blowing ride CRESS took me on! I learned early on from book one not to underestimate Meyer's and her mad writing skills. But for some crazy reason I always do just that, and each book just gets better and better, surprising me with a more engaging read each time! This book was hypnotizing and absolutely addicting from the very first page. I could not put it down for nothing, and I loved all the new and exciting characters that were introduced and became a great addition to this fantastic series! The characters were once again wonderful! Theirs so many main characters in this book that you would think it would be hard to follow, but surprisingly it's not. I found that all the characters and different POV's only developed the story more, making it complex and that much stronger. I really liked how in the beginning all the characters were together, and then slowly they all started getting separated from each other because of a different traumatic event that in my opinion only strengthened the story. And then you have all the different POV's from the characters in different places and your able to see what's going on all around the world. I loved all the characters for different reasons. Cinder because the girl has been through much and is still determined to save the same people who once mocked her for her disability. And plus she's going to kick Queen Levana's a** when they finally face off in WINTER, I KNOW she is, (at least she better! ;) That b*tch Levana needs a taste of her own medicine. But I still love her as the wicked villain that she is that only makes this story that much more as awesome! Scarlet because she has this admirable strength that only multiplies tenfold when she feels threatened. And when the girl loves, she loves hard! I think she may even be my favorite of them all! I don't know though, I do LOVE Cinder and Iko too! Cress because the girl brings a new light to this book that this series never had. And she's sweet and innocent, yet she's not afraid to get her hands dirty even when her life's on the line for strangers. And Iko is soo funny and instantly likable. Being an android and having so much personality and sense of humanity that is full of life and a bubbly demeanor only strengthened the book and brought a fun tone to the story. Okay, now for the boys. . .
Kai, ohhhhh, KAI is sooo swoony! He's Emperor, yet you wouldn't be able to tell if you didn't know who he was. He's down to earth and genuinely cares about people. He's also extremely hot but doesn't think he's better then anyone, and is willing to put himself last to save is country. Wolf because he's totally bada*s on the outside, yet when he's with Scarlet he's a big softy that'll would walk to the end of the world for. He is definitely my kinda guy! ;) THORNE, ohhhh, Thorne! He's another favorite of mine! The boy is all sarcasm and hotness! I LOVE HIM!!! He's always making light of any situation, and can make you laugh when really you shouldn't. He also lives behind his jokes, trying to hide the real him that is loyal and caring, and brave even when he doesn't want to see it!! Still on the run from both Earth and Luna, Cinder and her group of rebels are barley evading authorities as they prepare to face off with Levana and restore Cinder, the rightful heir to the Lunar throne. But their journey has been tedious and nothing short of deadly, and if they don't succeed in their mission, not only will they be doomed, but also all of Earth and Luna. Born a shell with no Lunar gift, and considered unworthy to live in society with the rest of her fellow Lunars, Cress, like all other shells are taken at birth and immediately executed in order to rid the moon of the abomination they bring when born. But, the secret that not many Lunars know, is that they're not really executed when taken from their parents. The truth is their blood is special, and harvested for the cure it holds for the rampant letumosis disease killing thousands of Earthens. They cannot be controlled by other Lunars, but they also have no mind controlling powers either. But Cress has a special talent far more worthy then just her blood, and is about to become just as deadly . . .
Cress is Queen Levana's best hacker, and she's been spying on Earth for far too long. Forced to do evil things for the queen, Cress has been imprisoned in her Satellite where she's cutoff from humanity and only has a mini version of herself for a companion. She has been secretly helping Cinder evade authorities from her seclusion in her Satellite, but Cress fears if she doesn't start producing results in "locating" Cinder soon, then she may find herself facing a punishment she won't make it out of alive. But how can she turn in the same people that could be her only hope for freedom? Scarlet is now carrying out her grandmothers last wishes by helping Cinder on her mission to save both the people of Earth and Luna by dethroning the evil tyrant Levana from the Lunar throne—thus saving earth from having a new evil Empress claiming their world for herself, and all her evil plans she has in store for them! Scarlet and their newly formed group of rebels have a plan, if only she can stay alive long enough to carry it out. . .
CRESS was an exceptional book that did a wonderful job with setting up the finale for the final installment in WINTER. I loved how this novel was evened out and weighed the chapters with the pace that made it all come together and fit just right. I especially thought CRESS went out with a bang, and was as solid as any ending could be. And I LOVED that Cinder and Kai FINALLY got to see each other again. Even if we only got a little time with them, it still set my heart aflame to have them back together again! I am so eager to start WINTER, yet hesitant to read it because I don't want it to be over just yet! 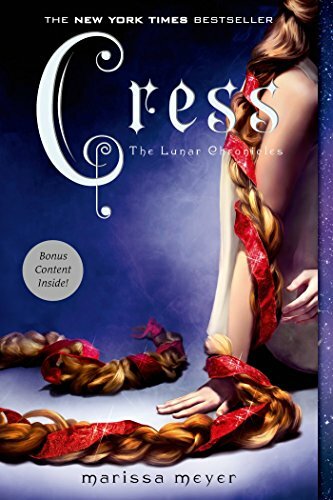 Overall, CRESS was a fantastic third installment that any Lunar fan would truly love! With a thickened plot and thrilling action, CRESS was tons of fun as sparks flew in this installment. I will forever love this series and will eagerly read anything Meyer's writes next! If your a HUGE Lunar fan then this is one installment you won't want to miss! NOTE: I received a physical ARC from Feiwel and Friends for reviewing purposes! All opinions expressed are my own and are not influenced in any way! 40 of 41 people found the following review helpful. LOVE it! It just gets better and better! I love fairy tales. I also love SciFi. Marissa Meyer does such an excellent job in putting these two together! It is amazing to me as well that in this third book of her Lunar Chronicles series that she also handles multiple points of view and story-lines so seamlessly without losing my interest or confusing me. This is storytelling at its best! I don't know how she comes up with the back-stories for her characters that build these amazing plots, nor how she creatively takes a beloved fairy tale (Rapunzel) and creates this amazing story. I just know that she does it well. I was immediately drawn in to Cress's world, her joys, and her fears from the first page. None of the characters in this series are perfect, and Cress is no different. I would say, however, that all the characters are perfectly flawed and I wouldn't change a thing about them. They are all consistent and I felt they react as they should if they weren't just in a storybook world. I loved Cress! She is amazing! She isn't my favorite character. I think Cinder, Scarlet, and Thorne are all vying for that place, but I still love all of these characters. I can't say that I love the villains, which are Queen Lavana and Sybil, but they are very true to who they are and what they do. I just have to note here that I am very happy with Thorne's place in the whole plot. I felt he was meant specifically for someone and now I know that he is and I am very happy about it. :) Prince Kai redeems himself to me in this book. I loved him in Cinder, not so much in Scarlet, and I am falling back in love with him in Cress. We also meet another leading man and a new leading lady that I'm sure will be much more present in the fourth book. I'm really looking forward to it! The plot kept me turning the pages. Meyer doesn't let her characters off easy. She is actually pretty hard on all of them. They have a serious fight they have undertaken with serious decisions to be made that have major consequences. I'm glad that it hasn't been too easy, even though it was pretty difficult in spots. I was a little worried about what would happen and I'm glad that I'm happy with the way things are going. I'm really not sure what is going to unfold in the final book. I can figure out what needs to happen and probably what will happen, but I also know that it is going to be a tough journey for Cinder and her companions. If you enjoy reading fairy tales (or very creative twists on them), or SciFi, then I would highly recommend reading Cress! The series just seems to get better and better. If there was a higher rating than 5, this book would get that for me. In this third book of the lunar chronicles we get to know Cress. She has been locked alone in a satellite most of her life where she has been forced to be queen Levana's personal hacker. Cress has grown tired of being stuck out in space and horrified by all the awful things that Levana has done, that she has in some ways helped her do, so she reaches out to Cinder and her small crew for help. But Cress' rescue is only the first thing that Cinder has to take care of. Then there is also the royal wedding where Kai is supposed to marry the Lunar queen, whitch Cinder knows is a horrible idea since that would only clear the path for Levana to take over Earth. Cinder can't just sit by any longer and watch Kai doom the people of Earth by making Levana not only the queen of Luna but also an empress on Earth. She has finally made a decision, she will dethrone Leavana and become who she was meant to be even though being queen was never what she really wanted. I really liked this book, there was a lot of action and we get even more additions to the already great cast of characters. Things are getting serious, the characters have some decisions to make and schemes to plot. I'm really excited for the last book, so far I have very much enjoyed the Lunar Chronicles and I hope that it's ending will not disappoint.